Discussion in 'SMB' started by foolzy, Nov 9, 2018. Put your address in here Discover your relatives who fell at the Battle of the Somme and find out how many were among the fallen from your street. Private John Henderson of the Australian Infantry from my very house. janiep, Chesterladmackem, Son of Stan and 1 other person like this. Not being an arse but how can you do this, I can't see a working link. Yep me as well. Just keep getting ads. Don’t even need to do that, I’ve got a couple of poor bastards, one on either side of the family interestingly/sadly, on the Theipval memorial who were never found. Found it, none in my search, but gonna try a few other houses I've lived in, thanks for the link mate. You don't need to put a house number, just a street name ìs enough as well. The lad who lived in my house had been demoted in April 1916 for going awol, reported missing in action in the August and then declared dead in July 17. I've found his records on the Aussie war records website as well. Sad seeing the lad's handwriting at signing up in 1915, and then a typed letter from his regiment in 1917 as someone (parents??) had obviously asked what happened. I put some old street names in and there are lots of names, some young lads from Durham, it's a good site mate. You can just put your family name and town in too, it works well, thanks for the link. It’s all very, very sad. Thanks for that mate, due to your post I now know where my great uncle lies. Doberman, foolzy and Snappy like this. Charles Edward Alfred Watkins. Lance Corporal. Somerset Light Infantry. D.o.D 15.4.1918. Age 19. SAFCOldie, Pseudonym Number 1 and foolzy like this. Charles Wardle of Northumberland Fusiliers also lived in my street. Aged 19, died a week before Xmas 1915. He was the same age as my young 'un is now, bloody hell man. Looked up where I live now, and there was a lad killed in January 1919 from my actual address. That is tough, survive the war, then somehow get caught up in the stuff afterwards. He was a stoker in the Royal Naval Reserve. I live in Glasgow now. There was a thing on the local news the other night. A guy has written a book about a disaster that happened on one of the scottish islands just after the war. All the men that had made it through were sailing back to the island when the ship ran aground just off the shore and sank killing them all! Imagine surviving 4 years of war just to die as your almost home! Was heart breaking. foolzy and Bishop Boy like this. Frank Emmet, Lance Corporal, Durham Light Infantry, Died 13th April 1917 aged 20 Buried at Arras Memorial. I only found out this afternoon my great grandad died on the first day of the battle of the Somme. He was never found and is listed on the thiepval memorial. LondonBlackCat, janiep and SAFCOldie like this. 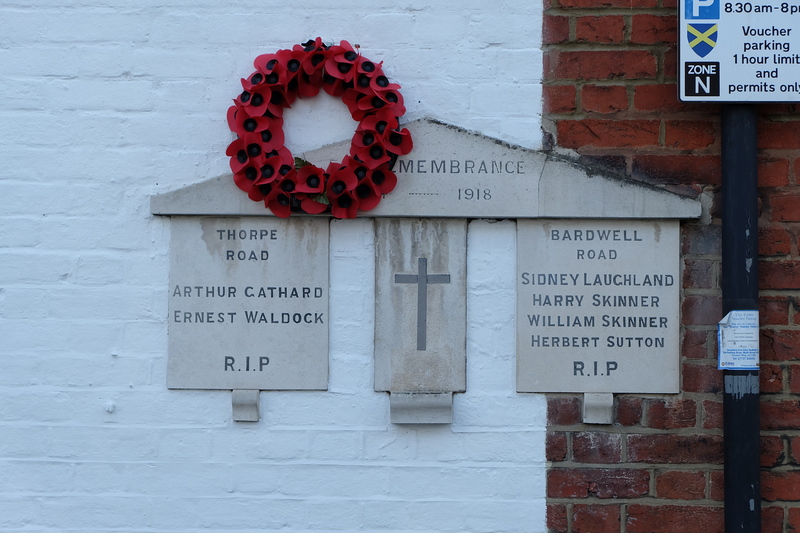 Our town was unusual in putting small war memorials on ordinary houses listing all who died in that street. Brings you up short very time you walk past one.